Our heat wave has abated so now it is just pleasantly warm, and the whale sightings continue to be fantastic. 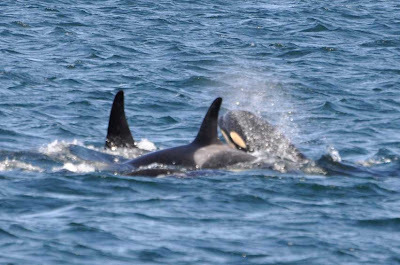 Yesterday we had a neat encounter with J27 Blackberry and J39 Mako, two brothers who were actively foraging a few miles offshore of San Juan Island. J27 was sharking (high speed swimming just below the surface with just the top of his dorsal fin sticking above the surface) and lunging in all directions. At one point he was close enough that we could see him swimming at top speed under water - amazingly fast, and amazingly cool to watch! There was a bit of a swell so it was too tough to take photos unfortunately. Then, on the way home I saw my first Heermann's gull (year bird 214) of the season. This was the last species I felt like I would get for sure this year, so now any others I add in the second half of 2010 will be an unexpected bonus! There are a few good potentials (come on barred owl! ), but no guarantees. 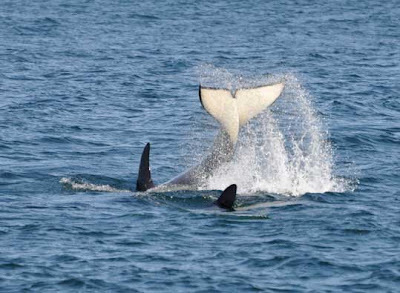 This year, however, the whales have been doing lots of different things, and groups of whales we typically expect to see together have often been mixing things up. 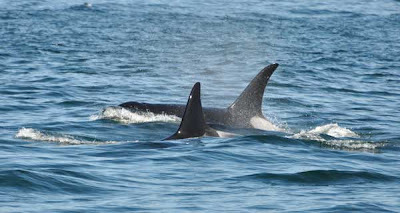 For instance, J-Pod has often been splitting into two groups, something they haven't often done in the past. 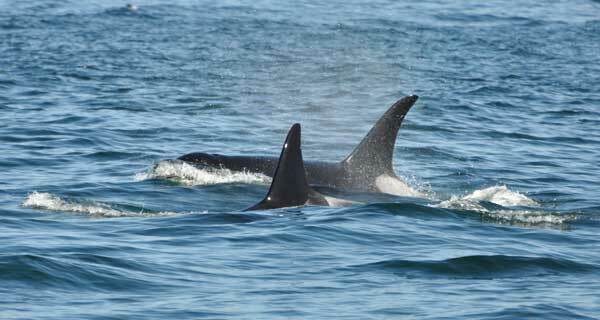 Four K-Pod whales have been traveling with part of J-Pod, and the rest of K-Pod hasn't been seen in some time. L7 Canuck and L53 Lulu have also seemingly switched back to traveling with J-Pod as they've done over the last few summers, after traveling with L-Pod earlier in the season. 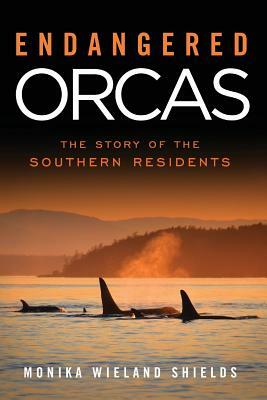 Although it makes it more difficult to figure out what is going on, I like it when the whales do the unexpected. Aside from being a fun challenge to keep of track of who's where, I think it gives us a glimpse into their social relations and hence their society. Above I talked about some longer-term associations, like L7 and L53 traveling with J-Pod for a whole summer, but I like looking at more temporary associations too. Today was very interesting as we had an odd mixture of whales traveling together - by my estimation about half of J-Pod and at least half of L-Pod. Dave has requested some video footage, so I've made a few attempts using the video feature on my Nikon. Here's a short clip from today showing the four whales described above. What do you think, should I try to do some more video? It takes a while to upload, I'll tell you that! I for one want more !